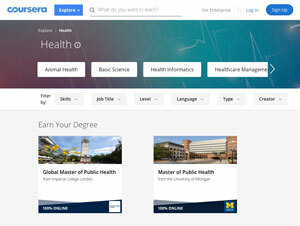 Coursera has partnered with 15 universities to develop a portfolio of health-related online courses to help address the global shortage of skilled workers in the healthcare industry. The portfolio includes 100 new courses, 30 new specializations and two public health-focused master's degrees designed to provide learners with the skills they need to enter high-demand jobs, particularly related to health informatics, healthcare management and public health. Each course is facilitated by faculty connected to the university offering the course. Among the occupations the training targets are informatics nurse specialists, clinical analysts, bioinformatics scientists, hospital administrators, and community health coordinators. Mountain View, CA.-based Coursera's content partners include Columbia University, Emory University, Imperial College London, Johns Hopkins University, University of Colorado, University of Michigan and University of Minnesota. Specializations focused on Biostatistics, Population Health Management, Nursing Informatics and Social Welfare Policy are designed to develop or supplement knowledge for those already working in the healthcare space or to provide a path to a career in healthcare. "The world's most pressing health issues require interdisciplinary, population-based strategies and training," said Dean F. DuBois Bowman of the University of Michigan School of Public Health, in a prepared statement. His school is working with Coursera to develop an integrated online Masters of Public Health degree program. "The field of public health will benefit from increased access to prestigious training opportunities, especially for adults who cannot participate in full-time residential programs," he said. In an e-mail response to Campus Technology, Daphne Kohler, co-founder of Coursera, said that while the company previously had a few popular courses and specializations in health, the topic area was fairly scattered. "This is a concerted effort, where the vast majority of the content is brand new," she said. "We have also curated [courses] specifically to respond to major challenges that the health sector is facing, concentrated in three primary areas tied to health career skills: public health, healthcare management and health informatics." Asked about whether there are issues with students getting academic credit toward degrees for taking individual courses from different campuses, Kohler mentioned the concept of "stackability" — the ability to combine various credentials to build up to a degree. Coursera offers courses, specializations, certificates and degrees. "The underlying component of all of these products is courses, and we believe deeply in the power of modular learning — learners are able to start, test and make progress toward their ultimate goals, learning new competencies and earning credentials one step at a time," she said. "Our degrees are increasingly stackable but for the most part, credit can only be allocated from the same institutions. We are introducing the benefits of stackability to one of our public health degrees. The Global Master of Public Health degree from Imperial College London will consist of 12 stackable specializations." The new specializations will roll out through 2019 and will be available for a subscription range of $39 to $79 per month. The two health-focused master's degrees from Michigan and Imperial are accepting applications in January. Asked if Coursera could develop similar portfolios for other vertical markets, Kohler said, "we're always looking for ways to help enhance the lives of our learners, so it is definitely a possibility."